While the trade disputes between the US and China loom large for Germany’s export-dependent economy, the developing malaise is broader. The German stock index DAX has dropped 15.4% since the end of January, even after today’s 1.3% gain. “Negative growth” in GDP is now a term that is cropping up to describe the third quarter. The median estimate of analysts surveyed by Bloomberg now shows a decline in GDP of -0.1% from Q2 to Q3. The official first estimate will be released Wednesday. The ZEW indicator measures expectations for the German economy, and is forward-looking. In November, instead of bouncing back after the plunge in October, it remained essentially flat with October, at negative -24.1. The readings for November, October, and July were at the lowest levels since August 2012, when the Eurozone was still scrambling to get out of its euro debt crisis. The indicator is 46.8 points below its long-run average level of +22.7!T his is happening even though the ECB’s negative-interest-rate policy (NIRP) still rules. To get this data, the ZEW surveys about 350 analysts from finance, research, and economic departments at banks, insurance companies, and large industrial enterprises, “as well as traders, fund managers, and investment consultants” (methodology). 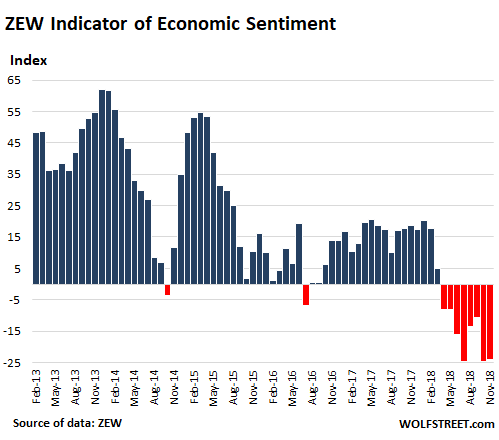 In addition to the forward-looking sentiment indicator, the ZEW also offers an indicator of how experts see current economic conditions in Germany. The forward-looking indicator of economic expectations in the Eurozone, which had already plunged over 12 points in October, dropped another 2.6 points in November to negative -22.0. The indicator for the current economic situation in the Eurozone, after having been nearly flat for two months, plunged by 13.8 points “to a level of merely 18.2 points,” the report said. The ECB’s economic stimulus in form of negative interest rates (still in effect) and QE (now being tapered to zero) have apparently expended their magic. Consumer price inflation in Germany has now reached 2.5%, even as the ECB’s deposit rate is still -0.4%. In other words, inflation is running nearly 3 percentage points above the central bank’s policy rate. This is called “financial repression.” Nothing good ever comes of it. I guess we can continue to blow people up (defense) and put them back together (health care) infinitely? I looked at your chart that shows the “Russian Panic”. What a dive. Do you think that there is room for Germany to go against NATO and the rest to regenerate trade with Russia? You have to be as good as any source to speak upon that. Germany is trading with Russia just fine. It’s importing lots of oil and gas from Russia, and it’s exporting all kinds of things. There are some embargoed items (i.e. gas turbines), but somehow they keep finding their way around the embargo. But Russia has never been a big export market for German goods, has never been one of the top 10. The US, France, and China are the top three. 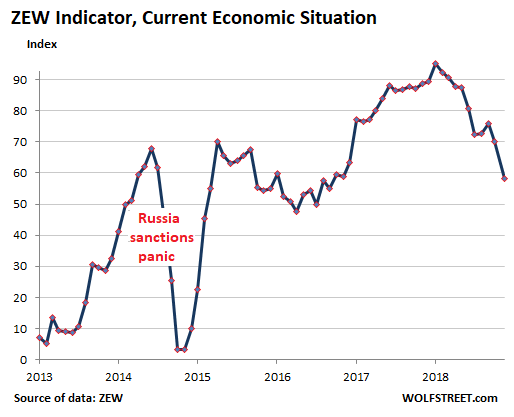 That’s why the 2014 dive was a “panic” — some companies specialized on Russia took a bigger hit, but overall it blew over, as you can tell from the chart. In the same vein as your post, why is constant growth necessary? Only to service debts? Why not restructure debts every year we have negative growth? It is not necessary, it serves a centralised management and control of the economy and society by creating a hierarchy of monetary supply, and is supposed to represent “order”. So we are aclimatised to “no losers”, only some “more successful” than others, and that is supposed to shut everyone up. When that fails, whether on purpose or by design, the pyramid gets flattened some and rebuilding it starts all over again. Over time though people forget how to build anything useful, they only build pyramids, and then they have to rethink everything if they are still able to. In a less centralised economy people generally mind their own business more, that means they own their own world, build stronger communities and plan so as to absorb the losses, if they are not simply avoided because in simple terms if you have no orders that day you just turn your hand to something else that is useful. That is the beauty of a local economy that is not ramped up, it is more resilient and dynamic, just not as potent and lacking the larger combined efficiency and might of a centrally organised one. People being people they tend to rely on the most convenient one, often forgetting their own ability and independence in the process, and so lose track of values. They will think any kind of reasoning to justify their deserve, even the more traditional minded allow themselves to be fooled, by not understanding or learning how the whole political, financial, monetary, economic world is framed. That is “progress” for you, but trying to hustle the east is also long warned. And who would you propose to take the haircut when the debt is restructured? Who is going to be the sucker? All this time, we worry about the PIIGS and the peripherals falling down and defaulting, what happens if the Germans get in trouble? The haircut should be taken by the lender (because borrower doesn’t even have anything). What happened to: “Investments are subject to market risks. Please read the offer document carefully before investing” ??? Because it looks good in theory and to win votes. First casualty of deflation is disinterest in spending money as you’ll be able to purchase good and services for less in the future. 2% inflation was the target because it ‘Goldilocks’ the interest rates without being too onerous, and generated a vertious growth in top line GDP and incentives purchase behavior. In this world of Tee shirt and Zipper city (giant Red machine) we loss possession of that sweet 2% juice. Germany doesn’t have a zero immigration policy, and most of the refugees are young, and could provide economic benefit. The global economic center of gravity is shifting decisively. Europeans and North Americans just haven’t accepted the fact yet. …your prize is waiting for you… in Bangalore. The EU will be bankrupt the minute a Greek/Italian/debt defaults and ECB guarantees are called in. The owners of the debt are in for a surprise, one day. It seems to me that the US and Japan have an easier time paying their debts then the bulk of the EU countries. The USA can’t pay off its debts AND meet the $250 trillion of unfunfded liabilities… AND keep the DoD happy. “Something” will have to give. p.s. – there is no intention of ever paying of the debts. They will be defaulted on either through reset…or hyper-inflation…or both. Europe simply does not have enough young people. As the populations decline, the economic output will gradually shrink. Not just Europe; pretty much the entire Western Industrialized world + Japan. WWII did create the perfect storm for a perpetual growth economy. Culled population + broken windows + baby boom. I’ve got a nauseating feeling that just like declining home prices weren’t built into pre-2009 economic models, neither are declining birth rates. China has a bigger demographic cliff coming than any of the above. Effects of the One Child Policy coming home to roost. – China ditched its “One Child Policy” a few years ago but chinese birthrates continued to be (very) low. – This is also a matter of not being able to afford more children. According to a well respected demo-graphologist. The worlds population will increase to 10 billion by the year 2050. Post 2050 the population will decrease and by the year 2100 will be back to 7 billion. Every continent will suffer population decrease except below sub – Sahara Africa. The key to population is education. The higher the standard of living and education standards the population goes backwards. Only mass immigration from Africa will cause the other continents populations from decreasing. The trick is keeping those 2050 10 billion supported with current resources and a steady financial system. Don’t worry, the US elites have the perfect solution: quasi-open borders. Desperate undocumented workers provide an underclass giving them more bang for their buck with labor. Just string them along with the promise that their kids will be full citizens and they’ll destroy their bodies for the lowest of pay. Then you don’t have to worry about the side affect of falling birth rates when the people faced with economic uncertainty in both wages and housing, often with huge starting debts in student loans, have trouble starting families. It’ll work great for a generation or two, and after that it’s someone else’s problem. – Also look at the US. – Even before 2008 the US was ageing. Immigration helped to reduce the pace of that ageing process (somewhat). – But after 2008 the birth rate dropped by some 20 to 25% more. (Our) average US citizens simply can’t afford it anymore to have children. Demographics move in spans of decades. They have no measurable impact on quarter by quarter data. There are good reasons why customers beyond her borders like to buy from Germany and those reasons will survive the current trade war posturing. Made in Germany is still fairly good quality and after over two decades of sinking wages (in real terms) and significant other efficiency gains, pretty good bang for the buck. The same cannot be said for much of the rest of €-Europe. The EU however will keep its protectionist course because Brussels is – contrary to what you’re told – dominated by smart, ambitious French grand ecole bureaucrats for which the generally third rate German exiles are no match. 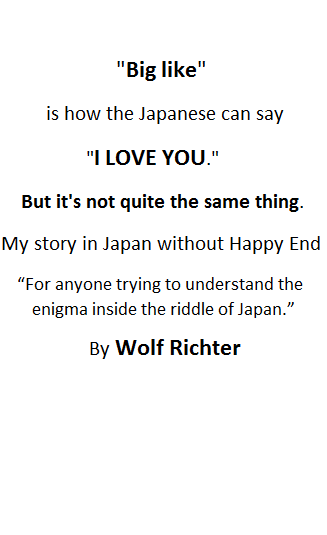 Probably a lot of that is the result of combining the attributes of East and West Germany after they were reunited. Remember German unions have also worked with (re conspired) with the state to depress wages to make exports more favorable. Also, German manufacturing is protected by the tariff walled EU, which they obviously promulgate. The real question is whether the nation which is will need to deplete its coffers to survive will bounce back or whether this is a new trend? – As time went by the worker’s/household’s/family’s income share of GDP has gone down in Germany. But Germany is NOT alone in this situation/predicament. It has happened in the entire industrialized world (Europe, North America, Australia, Far East, etc.). Keywords: “Increased productivity”. Because, contrary to common believe, increased productivity actually REDUCES demand. – And by going deeper into debt the (industrialized) world was able to add extra demand in the past decades. By going deeper into debt the world was able to paper over (for a while) the impact of reduction of demand (as a result of increased productivity). – Let me explain why increased productivity REDUCES demand. – Let’s assume that a producer produces 100,000 units (bricks, milk, pencils, cars, …… ) per month. And they do it with 100 employees, each earning $ 1000 per month. Then income and demand from these workers is (100 times 1000 =) $ 100,000 per month (assuming these workers don’t take on more debt). – Now this producer increases productivity by producing the same amount of units but now with 90 workers, each still earning the same $ 1000. Now total income and demand has dropped to (90 times $ 1000 =) $ 90,000. (again assuming that these workers don’t take on more debt). – And this FORCES the producer to lower its prices in order to save it turn-over. – And this is what the austrian school nutcases fail to wrap their head around. is to remain forever a child”. Financial history repeats with cyclical regularity. Well, well, it looks like NIRP/ZIRP turned out to be a failure after all, more or less as I predicted. Maybe they should try fixing the real economy this time, instead of rewarding the banksters who cause the fiascos. But where would the profit be in that? ->Financial history repeats with cyclical regularity. Well, cyclical frequency anyway, since the cycles aren’t all that regular. But you can call it whatever you like. Have you ever noticed it’s never the people who actually work for a living who cause the meltdowns? It’s always the result of financiers losing control of their overly ambitious and hopelessly overextended contrivances. And have you also noticed that the toffs who cause the meltdowns never suffer for them, and that always it’s the stiffs who are just trying to hold onto their jobs who end up getting screwed? It is always a mistake to enrich the wealthy. It just makes it that much more expensive to bail them out when they screw up. You should read “The Fourth Turning” by Strauss & Howe. It was mentioned on this site before so I read it. It explains the reason behind the financial history repeating cyclically (and many other cycles). It really is mind altering. ->You should read “The Fourth Turning” by Strauss & Howe . . . It really is mind altering. You should read “Tragedy and Hope” by Carroll Quigley. It makes people wonder why they bother chewing through the leather straps. Depends on from which side you are looking at it. Looking at it from central bank’s perspective “financial repression” helps blow bubbles in asset prices, creates “wealth effect” and its trickle down effect is good for the average citizen. Ask Ben Bernanke, the self-appointed expert on this topic! I believe a factor of the current decline in birthrate is that in the last few decades, half young adults want to have fun in their 20’s and settle down in their 30’s because the life expectancy is longer. Some of my generation (39 now) have kids in college, some have young children like me. the spreading out of having children means that there are not as many equally aged children to find relationships and start families. Another factor would be technology, there are many more choices for entertainment for current generations than there were for baby boomers, less time for intimacy. Debt incurred by small countries is allowed by the creditor. Once the country is in debt beyond its means, no matter what government comes to power, the outstanding debt forces the government to obedience. Debt, is a method of control, no different then supplying drugs to an addict. The institutional powers always take the side of creditors and impose debilitating and Draconian measures resulting in asset depreciation and loss of liquidity. And then you simply buy up everything for a handful of dollars. Greece. Debt is a modern day weapon of mass destruction. Debt incurred by large countries can be for a variety of reasons, but in general as of recent I would state it’s due to tax evasion, the inability of countries to push for systematic financial regulation, or they have simply an unhealthy economic policy. My point being, every country in Europe has a specific problem as seen from previous articles by Don Quijones, and it would be wise to treat them as such. Some are self inflicted, some are imposed and each economy will react differently to the demise of the euro and the impending crisis. The comment about an EU military tears it for me. I have to assume they mean a quasi UN force. Do they mean “SHRINK” or “SINK”?